Two creative entrepreneurs have put the kettle on and are offering others like them a cuppa and a chinwag about growing their businesses. 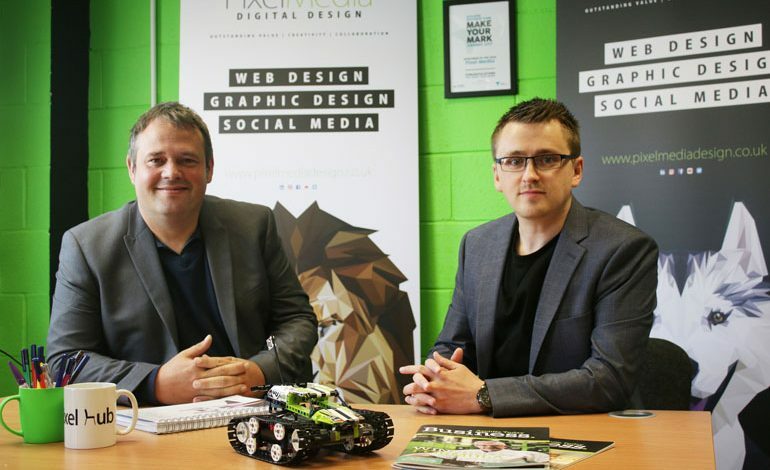 Ian Proctor and Graham Marsh are co-founders of Pixel Media, based at Aycliffe Business Park, and they want to share the warts and all experiences of their first year in business. The pair were helped by Durham Business Opportunities Programme (DBOP), part of business support organisation Business Durham, as they set up their digital design business. Ian and Graham were attendees of DBOP’s Business Improvement and Growth Programme – which is exclusive to businesses based on Aycliffe Business Park. The workshops cover the essential aspects of growing a business, featuring practical advice from experts. Now their latest idea – The Pixel Hub – offers other entrepreneurs the chance to get together to share their start-up challenges in a relaxed format, for free. Ian explained: “The Pixel Hub is a monthly session where we open our doors to any start-ups and small businesses that want to come and chat about how to get through that hard part of setting up a business. Ian, who was a primary school teacher prior to setting up his business, added: “I always thought it was quite a lonely place running a business, but the DBOP programme showed me that’s not actually the case. “There is a wealth of support out there – everything from finances to finding leads – and there are people to point you in the right direction, whatever you need. The first Pixel Hub event saw small businesses from across different industries – including a physiotherapist, an insurance broker and a recruitment consultant, among others. Sarah Slaven, business development director at Business Durham, said: “Ian and Graham have made a great success of their first year in business as Pixel Media and it’s fantastic to see they’re now using all the knowledge and experience gained in that time, and through DBOP, to help other businesses. DBOP is a three-year programme for SME’s which is funded by the European Regional Development Fund (ERDF) and delivered by Business Durham.